KEAM Centralized Allotment Process (CAP) 2014 and online registration submission process is explained here. The activities related to the allotment to Professional Degree Courses (Except MBBS/BDS) for the year 2014-15 will commence soon. Candidates, who are included in Kerala Medical (Except MBBS/BDS)/Engineering/Architecture Entrance Examination rank lists, can register their options on the website www.cee.kerala.gov.in before the stipulated time. The activities related to the allotment to Professional Degree Courses (Except MBBS/BDS) for the year 2014-15 will commence soon. Candidates, who get included in Kerala Medical (Except MBBS/BDS)/Engineering/Architecture Entrance Examination rank lists, can register their options on the website www.cee.kerala.gov.in before the stipulated time. Those candidates who do not register their options within the specific time will not be considered for allotment. The office of the Commissioner for Entrance Examinations will set up the 'Option Facilitation Centres' (OFC) and 'Help Desks' (HD) with internet facility throughout the State during the period. This facility is being introduced to provide necessary help to the candidates for registration of options by the candidates. The details of such centers will be made available on the website, www.cee-kerala.org. As the admission procedure is being done through the Centralised Allotment Process, students must be well aware about the methodology. After the CEE announces the opening of the option registration facility, those students who found their names included in the KEAM 2014 rank list can apply online. Later the trial allotment will be published followed by first and second allotments. Even though the trial allotment does not ensure admission for a course, but it will give an idea about the chances of getting access to a college. Before the declaration of the first allotment, students would be given ample time to edit and revise the options. As there will be only two allotments in Private Self-financing Engineering colleges, candidates who are allotted to those Colleges will have the provision to cancel the allotment till the first phase of allotment ends. Students can download the notification regarding the CAP 2014 from the CEE website. This notification would give a clear picture about the names of colleges with fee structure for various courses. For more details about the KEAM Centralised Allotment Process (CAP) 2014 and online registration submission process do visit the official website. Kerala Plus One single window admission 2014 -15 HSCAP centralised allotment process (procedure) details are given here. Higher Secondary centralized Allotment Process (hsCap) which is popularly known as Single Window Admission is an innovative step introduced by the education department to bring optimal transparency and efficiency in the admission procedure. This system which had been functioning from 2008 had already won two national awards and one state award for its consummate performance. Kerala University degree admission 2014 centralized allotment process (CAP) online registration for the degree courses/ under graduate (UG) programme details are given here. 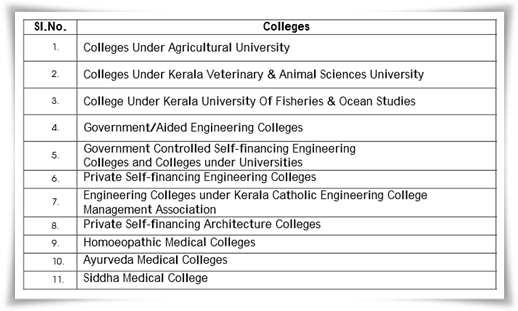 The Kerala University has invited applications from candidates for their UG programmes in its affiliated arts and science colleges and UIT centres for the academic year 2014-2015. The submission of the application forms started from 14th May while the last date would be 5th June 2014. Kerala Plus One admission 2014 -15 online registration is available at HSCAP website. Online registration of 2014 -15 admission for Ekajalakam/ single window system will start on 26th May @ www.hscap.kerala.gov.in. Kerala Plus One Admission 2014 is much important with around 3.27 lakh seats available for students in higher secondary school's first year batch and 26,750 seats in VHSE, the single window system would play a key role in providing admission to the students. Online transfer and posting of teachers in Kerala 2014-15 details are given here. With the effective implementation of the E – Governance system initiated by the IT@School Project, the transfer and posting of Headmasters and teachers in Kerala has now become an easy task. As the system has element of transparency, the transfer and posting of teachers is done based on the priority opted by them. Read more to know about the system. KEAM 2014 online engineering mark submission/entry notification has been publicized at www.cee.kerala.gov.in, the official website of KEAM exams. As the notification regarding the submission of marks date for the preparation of engineering rank list 2014 has been announced, students who have qualified in the Engineering Entrance Examination 2014 should submit the marks obtained for Mathematics, Physics and Chemistry in the Second year of Plus Two through the official website.